The Afroasiatic languages constitute one of the world's largest language families with about 375 living languages and more than 350 million speakers spread throughout North Africa, the Horn of Africa, and Southwest Asia, as well as parts of the Sahel, and East Africa. The most widely spoken Afroasiatic language is Arabic, with 230 million speakers (all the colloquial varieties). In addition to languages now spoken, Afroasiatic includes several ancient languages, such as Ancient Egyptian, Biblical Hebrew, and Akkadian.— Excerpted from Afroasiatic languages on Wikipedia, the free encyclopedia. Akkadian (also Accadian, Assyro-Babylonian) is an extinct Semitic language that was spoken in ancient Mesopotamia. 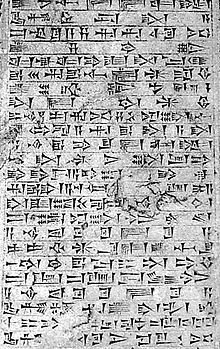 The earliest attested Semitic language, it used the cuneiform writing system derived ultimately from ancient Sumerian, an unrelated language isolate.— Excerpted from Akkadian language on Wikipedia, the free encyclopedia. Aramaic is a Semitic language belonging to the Afroasiatic language family (etym. language of Aram, an ancient region in central Syria). Aramaic script was widely adopted for other languages and is ancestral to both the Arabic and modern Hebrew alphabets.— Excerpted from Aramaic language on Wikipedia, the free encyclopedia. Coptic is the final stage of the Egyptian language, a northern Afro-Asiatic language spoken in Egypt until at least the 17th century. Egyptian began to be written using the Greek alphabet in the 1st century. The new writing system became the Coptic script, an adapted Greek alphabet with the addition of six to seven signs from the demotic script to represent Egyptian sounds the Greek language did not have.— Excerpted from Coptic language on Wikipedia, the free encyclopedia. Egyptian is the indigenous language of Egypt and a branch of the Afroasiatic language family. Written records of the Egyptian language have been dated from about 3400 BC, making it one of the oldest known recorded languages.— Excerpted from Egyptian language on Wikipedia, the free encyclopedia. Hebrew is a Semitic language of the Afro-Asiatic language family. Culturally, it is considered the language of the Jewish people, though other Jewish languages had originated among diaspora Jews, and the Jews were only part of the whole Hebrew/Canaanian sprachraum.— Excerpted from Hebrew language on Wikipedia, the free encyclopedia. The Moabite language is an extinct Canaanite language, spoken in Moab (modern day central-western Jordan) in the early first millennium BC. It was written using a variant of the Phoenician alphabet. Most of our knowledge about Moabite comes from the Mesha Stele, which is the only known extensive text in this language. Syriac is a dialect of Middle Aramaic that was once spoken across much of the Fertile Crescent. Having first appeared around the 1st century C.E., Classical Syriac became a major literary language throughout the Middle East from the 4th to the 8th centuries, the classical language of Edessa, preserved in a large body of Syriac literature.— Excerpted from Syriac language on Wikipedia, the free encyclopedia. Yiddish is a High German language of Ashkenazi Jewish origin, spoken throughout the world. It developed as a fusion of German dialects with Hebrew, Aramaic, Slavic languages and traces of Romance languages. It is written in the Hebrew alphabet.— Excerpted from Yiddish language on Wikipedia, the free encyclopedia.